Like many similar mice available today, the braided cover on the mouse cord is rather inflexible which adds movement resistance. The mouse is well-suited to a fingertip or claw grip. The profile and thumb button placement is poor for a palm grip, plainly intended for somebody with large hands. It is heavy enough but I would add additional weight if it were possible. The right click on my review device seems a little mushy though not particularly troublesome or noticeable during use. The sensor is optical, not laser, which is a positive in this price range. The sensor is slightly right of center which throws off twisting motions if you're used to a centered sensor, but it's easy to get used to it. The mouse drivers allow you to set a variety DPI sensitivities and polling speeds. Of these I prefer a polling rate of 500 Hz + 1200 DPI. None of the combinations seemed to behave unexpectedly. There appears to be no jitter. In fact, performance in this respect was superior to some more expensive mice I use. I could not detect any angle snapping, correction, smoothing, or hardware acceleration—good. See the image below. There seemed to be no interpretation of my input whatsoever, so it was no surprise that there was no appreciable lag. Pixel walk is also absent (good). I was pleased that this mouse does not exhibit these issues which are two of my personal pet peeves (I hate Bluetooth rodents). Lift off distance is approximately 2 mm. The maximum perfect tracking speed and skipping speed are still far better than my customary usage. I did not encounter any issues in this respect. The software for this mouse has two running x86 processes weighing in at 15MB. Screen contrast is poor so it is hard to see some options. I didn't realize at first there is an indication of the currently selected DPI. The breathing multi-color lights can thankfully be disabled (or toned down and customized for those who want to retain some of the light show). Typical button reassignment and profile management is included but there is no macro recording or playback. Unfortunately, profiles are not stored on the mouse itself. 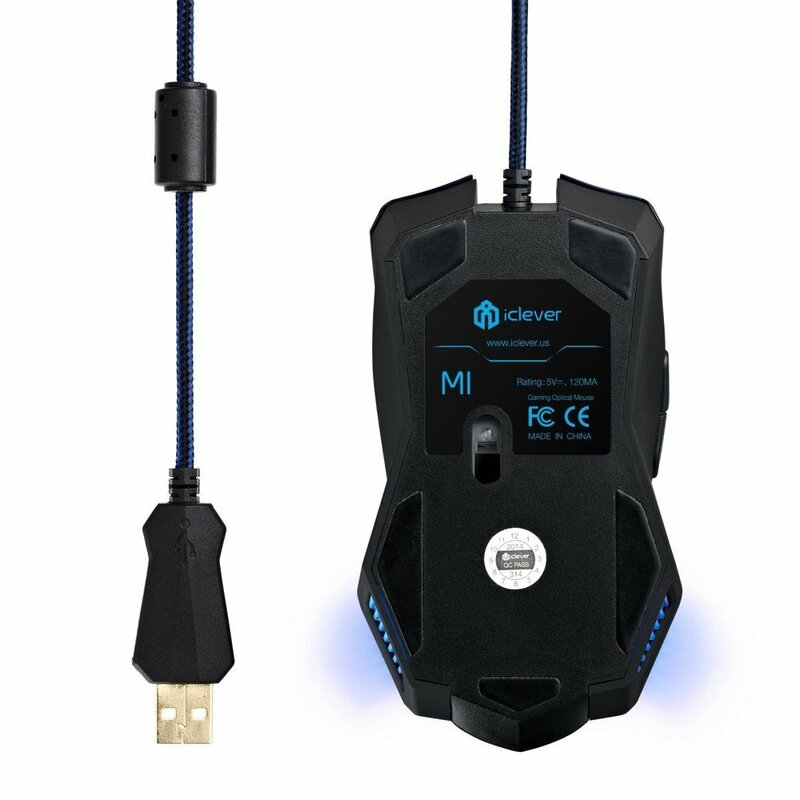 The iClever Gaming Mouse is great gaming mouse for the price. It is a good gaming mouse at any price. The mouse is a bit light, and the drivers are a bit heavy, but I'm pleased to use this mouse and can recommend it to those looking for 1:1 input at a reasonable price. I jumped into some CS:GO and TF2 as a sniper and was right in the game after a minimal period to get used to the new mouse.